What are Northern Spy apples like? Northern Spy apples are very juicy, crispy crunchy, tart and mildly sweet, with a rich flavor and thin, tender green and red skin. Great for pies and cider! Also preferred as a dessert apple after they have had time in storage to mellow out. More tart and firm than most popular varieties, so most people don’t like to eat them out of hand. 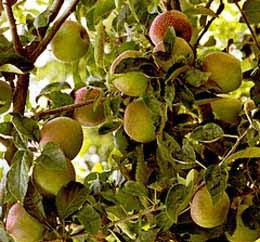 Are Northern Spy apples good for storage?